Shift Rules are used to take care of overtime, awards, weekend rates, penalty rates, etc. 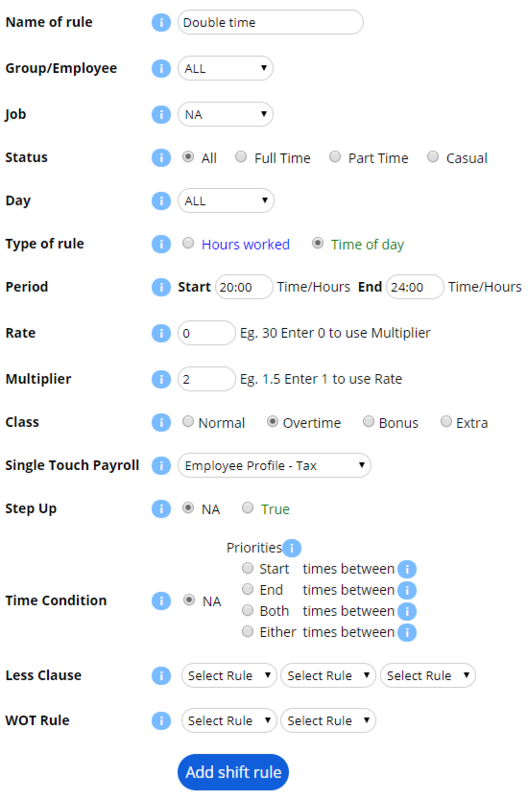 Shift rules are created to automate the calculation of overtime and other awards. John Smith clocked on at 9 am and off at 9 pm. When payroll is run, the shift rules will be applied. and 1 hour has been calculated at double time. This is all automatically done from the timesheet data and the shift rules. A step up is when an employee performs a task beyond their usual tasks. Step ups attract additional pay rates. Shift rules can be created that will only apply when the employee is entitled to the step up. Continuing from the above example. When John Smith fills in for his supervisor he is entitled to an additional 15% pay. The SU1 is the same for all rules, all characters up to the first space make up the code, this means all 3 rules will be applied if required. To activate the step up option make sure to select true when creating the shift rule. John Smith clocked on at 9am and off at 9pm. Only shift rules that contain SU1 will be applied, all other rules will be ignored. This will automatically be applied and displayed on his payslip. Rules can be created to suit any circumstance.